A moonless night covered the Egyptian city of Alexandria like a dark cloak. 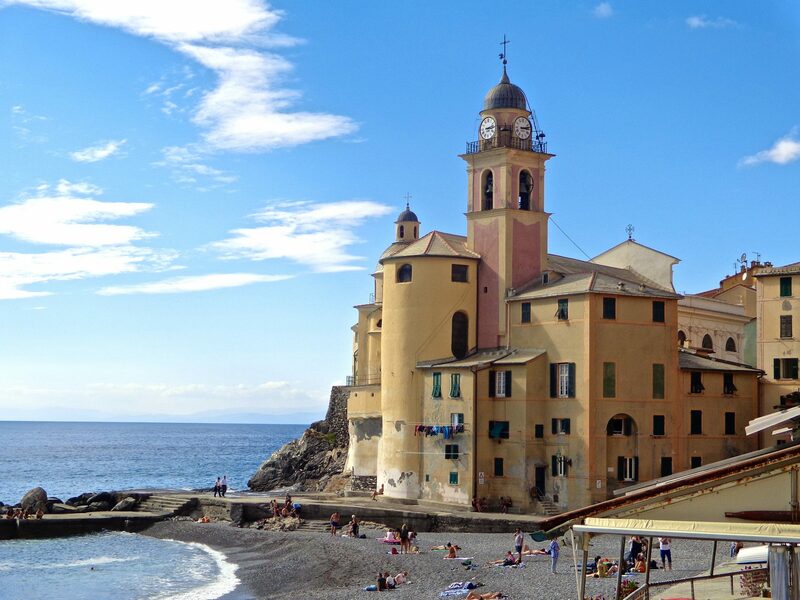 Two figures scurried down through the town and toward the harbor, pushing a cart, where a ship awaited them. A small envoy of men gathered on deck, ready to help them lift the cargo onboard. 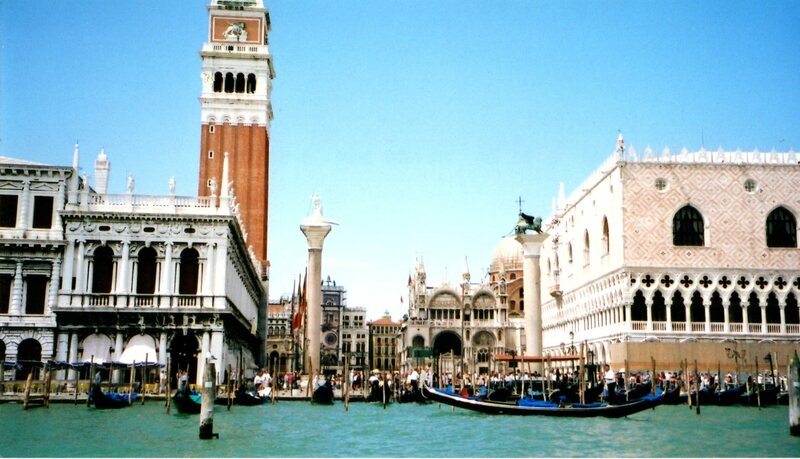 Mission accomplished, they quickly set sail for Venice. It was the year 828. Pork and cabbage leaves filled the cart, meat that the Muslim guards refused to touch since they considered it unclean. Little did they know, or even suspect, that they had just lost their city’s most precious relic, the body of St. Mark the Evangelist, buried underneath. Why all the excitement over St. Mark? Who would go to such lengths as to steal a body from another country? Who exactly is he? Mark was born in Cyrene, which is in Libya today, to Jewish parents. After migrating to Palestine, he witnessed the ministry of Jesus Christ and became a follower. Mark is the author of the earliest gospel of the New Testament. 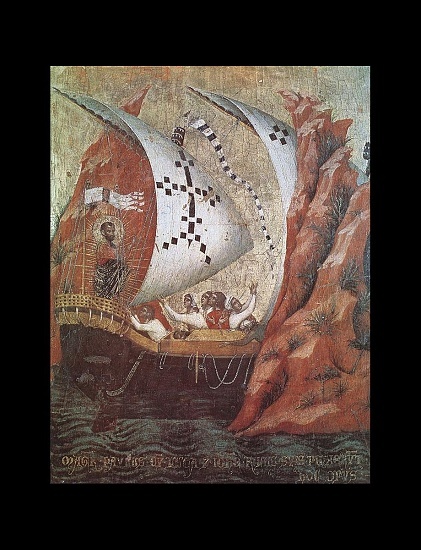 In his lifetime, Mark founded the Coptic Orthodox Church of Alexandria in 48 AD. Unfortunately, the citizens began to resent him for attempting to turn them from pagan worship. Finally, in AD 68, a rope was put around his neck and he was drug through the city until dead. 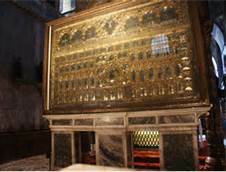 Ah, to have the relics of a saint, (all but his head, which was left in Alexandria), and a popular one at that. This alone could catapult a city’s status and prestige above that of others. ‘Steal the best saint-build a cathedral around the bones.’ And so the Venetians did. Once Marks body arrived back in Venice and into the Doge’s (ruler of Venice) lap, construction began on a church next to his palace to house the precious relics. Great excitement embraced the people for having attained the relics of St. Mark, which elevated Venice equal in status to that of Rome. 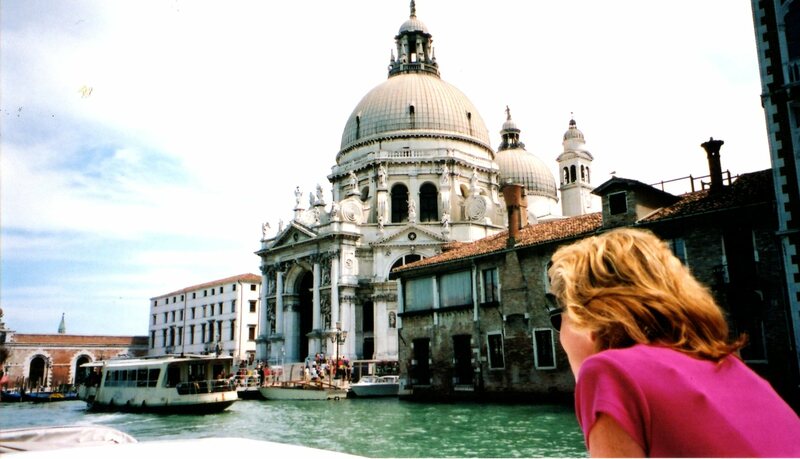 San Marco’s Basilica remained a private church of the Doge, and was not made public until the 1800’s. Sinister happenings occurred in 1063 during the construction of a new basilica. St. Marks body was nowhere to be found. It wasn’t until 1094 that, according to tradition, Marks arm appeared, extended from a pillar in the church and pointing to his relics. Where they were or what happened no one knows for sure. 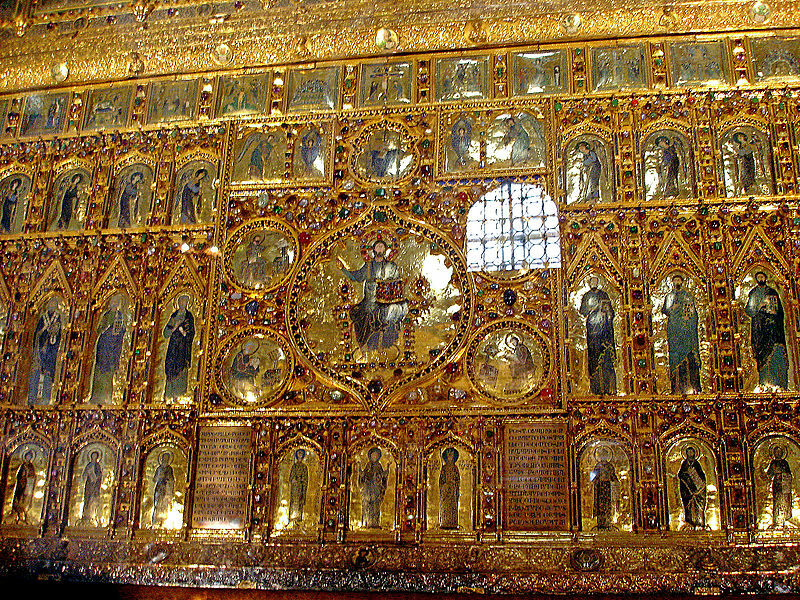 The Pala d’Oro, meaning “Golden Cloth,” an altarpiece embellished with gold and precious jewels brought back from the sack of Constantinople during the 4th crusade, is part of the High Altar in the basilica which houses the remains of St. Mark. At a later time, some of the relics were given to Cairo’s Cathedral of St. Mark. What begins as sinister seldom ends without suspicion. Recent speculation from a British historian, Andrew Chugg, claims the bones under the High Altar in Venice are not those of St. Mark, but of Alexander the Great. Because of gaps in history regarding body whereabouts of both, without DNA testing there is no way of knowing. Deemed as doubtful by his colleagues, St. Mark continues to keep his basilica securely in Venice. 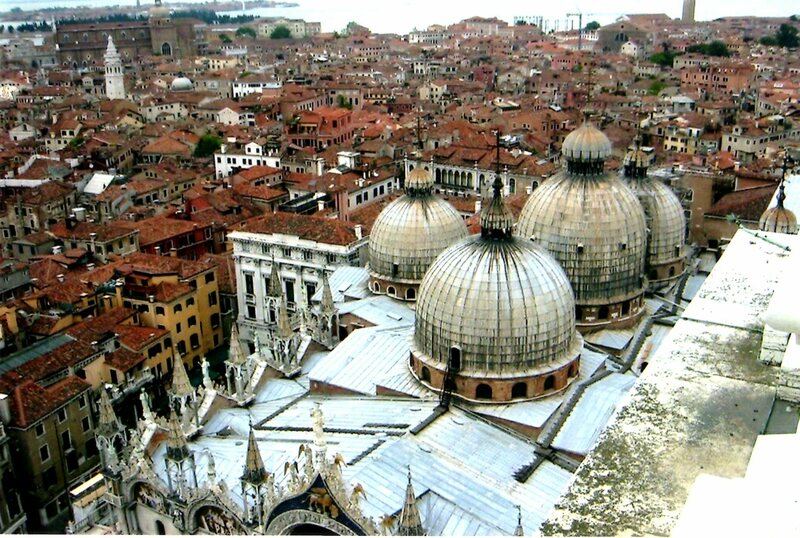 *Churches and Basilica’s of Venice-Explore 1,000 years of history!